Briefly, what does escaping do again? 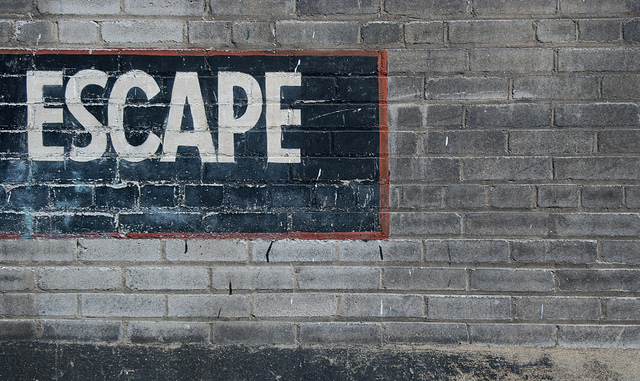 How do we know if we should escape? A handy reference for escaping WordPress template functions. When should we escape a WordPress template function? Honestly the most straightforward rule I’ve been following is to escape everything. Better to be safe than sorry. Many others agree with the sentiment. Not to mention, it’ll help make escaping a regular habit if it’s constantly done during WordPress development. However, there are two cases where you might not want to escape. The first case is if you want any HTML to come through depending on what you need the content for. The visual tab for the text editor. The text tab for the text editor. 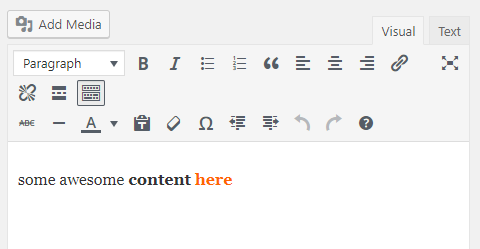 Now in a page template, I’ve used PHP to set up a WordPress loop and tried three different ways to get the text editor content. The first way is using the_content() which converts line breaks into paragraphs and allows the HTML to do what it needs to do. The second way echos out get_the_content() instead without escaping, and while it no longer converts paragraphs, it still allows any HTML to output what it needs. The third way, I echoed out get_the_content() again except I escaped it. There are still no paragraphs, however, the HTML is being displayed on the front-end instead of being interpreted by the browser. Notice how the strong and span tags used to bold the text and change it’s color are now visible on the front-end in my screenshot below. What each of the three ways for getting the content look like on the front-end of a site. Therefore whenever you use a template function, be aware of it’s purpose in your project before deciding whether to escape it. The second case to reconsider escaping is if the function already escapes in WordPress core. If you escape a function that already escapes, you’re just escaping the same thing twice. And this is where we move onto the reference I mentioned earlier in the post. Continue reading for a list of commonly used template functions, where they’re defined in WordPress core and whether they need escaping. The three most common escape functions I use are for escaping text content, urls and HTML attributes ( for things like classes or IDs ). The difference between the esc_something and esc_something_e functions are that the latter allows for translation. The latter also already echo’s the data whereas with the esc_something, we have to add the echo in. I always go the translation route for text escaping by default. The only time I do not set up for translation is if I’m pulling dynamic content from the dashboard – in other words text that isn’t static. It would be hard to translate text that’s constantly going to change and depends on the user. Any content that is part of the theme such as buttons, screen reader text, or headings that aren’t going to change, I will escape with translation. Even if you don’t plan on ever translating your theme into multiple languages, there’s no harm in setting it up. Should you decide change your mind in the future, the code work is already done. Another two tips! We only want to translate text content, not text used for HTML attributes like classes, IDs or data attributes. We can escape them, yes, but not translate. As for accessibility, screen reader text should always be set up for translation and escaping. Back on topic! Which escape function to use for each type of data? If it’s a title or some sort of content where we’re only expecting text, then use either esc_html() or esc_html_e. If it’s a url, then use esc_url(). And if it’s an HTML attribute, use esc_attr(). And finally, which WordPress template functions need escaping that core doesn’t already do the job? The handy reference is below. If you see something not quite right, feel free to give me a shout in the comments and I’ll make corrections. I did a quick run through a default WordPress theme just to grab what I thought were the most common template functions. A lot of the functions call to other functions and I didn’t always specify that below. However I provided the file where the starting function can be found so that you’re free to follow the chain if you’d like. *As I mentioned earlier, keep in mind what you need a function for before you escape it. If the table below says “Yes” for “Can I escape?”, it doesn’t necessarily mean you have to – it means that you have the option to and can make that decision on a case by case basis. Function File Location Can I Escape? Calls to to get_the_archive_description() which then calls term_description() and there’s a bit of a rabbit hole. Seems like it would be safe to escape here just in case. Yes – just in case. As you can see, in most cases above, escaping WordPress template functions is a necessity. Every WordPress theme is different, and should you use other WordPress template functions that you’re not sure about, feel free to check core files. The rule of thumb is to always escape, but there may be the occasional case where you’ll need to reconsider. Thanks! Haven’t tried the wp_kses functions yet. Will def give them a go. Thanks for sharing your knowledge. Awesome posts, thanks for sharing!